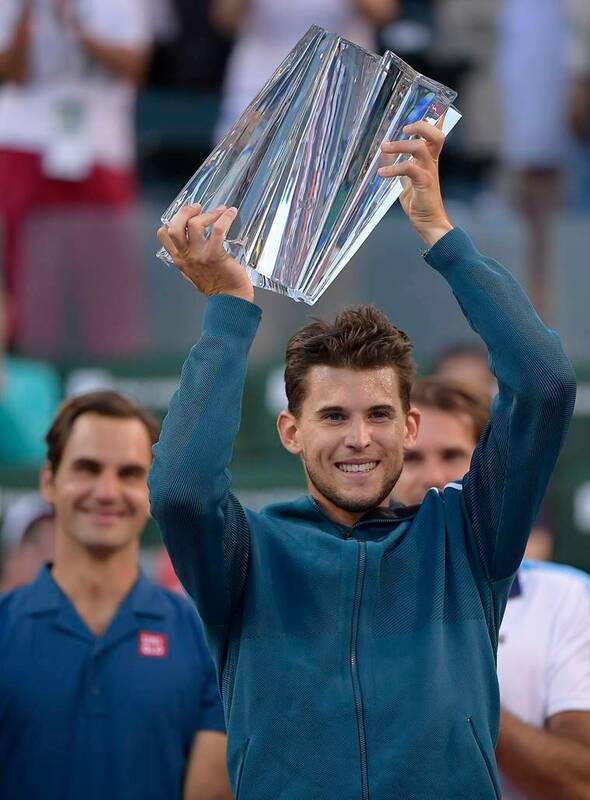 Dominic Thiem claimed his first Masters 1000 title after coming from a set down to defeat Roger Federer 3-6 6-3 7-5 and win the BNP Paribas Open on Sunday in Indian Wells. The Austrian fell on his back and covered his face with his hands when Federer, who had been bidding for a record sixth Indian Wells title and 101st tournament victory, netted on match point. The 25-year-old Thiem, who will rise four places to a career-high world number four on Monday, paid tribute to his opponent. “It is such a pleasure to compete with you, to learn so much from you, and to play with one of the biggest legends of all time,” he told the 20-times Grand Slam champion during the trophy presentation ceremony. “I feel like it’s not my right to congratulate you, you have 88 more titles than me, so I’m just hoping you play more and we can have some other big finals,” he said with a laugh. Federer was gracious in defeat after falling in the final in the Southern California desert for a second consecutive year. “It has been a great week for me even though it didn’t work out today,” he said.